Beachcomber has all the comforts of city living with the relaxed atmosphere of the beach. 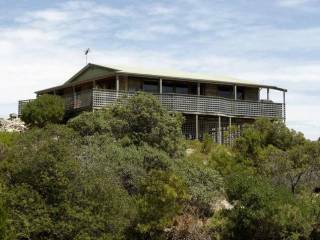 The house is surrounded by native flora and fauna and home to many birds and wallabies, and for the avid nature lover the occasional echidnas and goannas. The house has been set up perfectly for a stress free break. Beachcomber is a modern, comfortable home away from home, fully equipped with everything to make your stay as relaxed and enjoyable as possible. 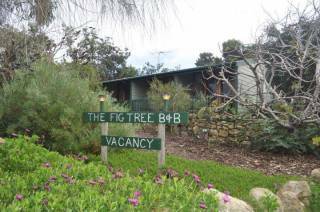 Recently refurbished, airconditioned and awarded a 4 star rating it is the perfect accommodation choice. There are 4 bedrooms – 3 with queen sized beds, one with ensuite bathroom, two with ocean views and a bunk room sleeping 4. All bedrooms have ceiling fans. The living areas are spacious and light filled with expansive sea views from all aspects and a wood burning heater for cosy winters. For times when guests are not enjoying the sights and experiences of the island there are games, puzzles, television, ipod dock, DVD and CD players. Books on Kangaroo Island are provided for guests use, as are walking maps, and information folder. The kitchen contains all the utensils and appliances you would expect to find in a city home. The deck enjoys panoramic views of the water, beach, and headlands while still providing guests with privacy. There is a gas BBQ for easy cooking. Beneath Beachcomber is a games room with pool table, second television and CD player. The house enjoys panoramic views from both inside and the spacious outside deck. We are proud of our property and ask guests to treat the house and all of the contents with respect. Naturally an accident can happen and in this case we ask that guests notify us if there has been any breakages or damage. On the whole this can be easily rectified, but can cause an issue if left as missing glasses, kitchen items or non functional appliances can affect the next guests enjoyment of the property. Please do not exceed the number of guests booked. This will result in loss of the bond. Should you have a change to your plans and wish to increase the number just let us know and we can adjust any monies owed and make sure the property is ready for that number of guests. We run entirely on rain water. This is a finite amount and only replenished when it rains. Please be aware of this and do not leave taps running or have long showers. Other travellers enjoy the peace and serenity of our unique island location, we ask that guests do not make excessive noise or play music late into the night. We have a guest information folder which has lots of suggestions of holiday activities and some general household tips for guests. Things that guests will need to bring. We supply blankets, quilts, pillows and tea towels unless you have requested linen. You will need to bring your own bathroom towels, face washers, and hand towels unless you request linen, when they will be supplied for you. A modest supply of dishwashing liquid, dishwasher powder, soap, and 2 rolls of toilet paper per bathroom is also provided. These items are supplied as part of the booking however they are just the basics and we would ask people to keep in mind that it is a self-contained property and that they should cater for their own needs in these areas. All food requirements and drinks are the guests’ responsibility and can be brought to the Island or purchased in Penneshaw or Kingscote. Deposit of 20% non-refundable is required to secure the booking. Payment of the rental deposit constitutes the clients acceptance of these Terms and Conditions. Balance of the rental amount must be received in full 30 - 60 days prior to occupancy (depending on season). If not the owner has the right to cancel the booking and attempt to re let it. Any cancellations must be in writing a minimum of 60 days (peak) or 30 days (other) prior to occupation date. If received within this time frame the client will receive 50% of their deposit. Should the cancellation occur less than 60/30 days prior to the occupation date the whole deposit and/or other monies paid will be forfeited unless the property is rebooked. The owners will make every effort to ensure the property is available as booked, however reserve the right to make alterations to bookings due to unforeseen circumstances and in this case a full refund will be paid. A bond of $500 is required at the time the final payment is made. This is fully refundable provided the Terms & Conditions of stay are adhered to. Number of Guests should not exceed the number stated on the Confirmation Notice or subsequently agreed in writing or email. An additional charge will apply for excess guests not agreed with the owners in advance. Parties and Functions are strictly prohibited unless pre-arranged with the owner in writing. The price charged is for domestic use only and not commercial. Accordingly this rate does not allow for the extra wear associated with functions in terms of cleaning, garbage removal, wear and tear, repairs etc. Use contrary to this may result in loss of your bond and/or additional payments. Damage, Breakages, Theft and Loss are the tenants’ responsibility during their stay. Departure - the property should be left in a similar state to its condition on arrival. Check-out time is 10.00am by the latest, to allow time to prepare the property for next guests. For the protection of the wildlife and the chances of other guests being allergic to animals Pets are not allowed. If this condition of rental is ignored there will be an immediate loss of bond and the rental shall be terminated. Loss - the owners take no responsibility for the tenant’s personal property. If you require further explanation of these conditions or require any further information about Island Beach Escapes properties please do not hesitate to contact me. Beachcomber is located right on the seafront at Island Beach on the corner of De Couedic Drive and Cassini Street. 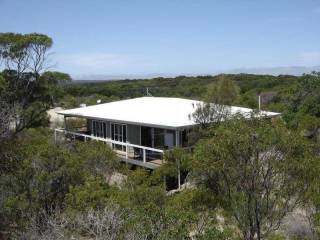 From the ferry terminal at Penneshaw it is a 15 minute drive, or from the Kingscote airport approximately 30 minutes. Guests will be provided with further directions and information for accessing the keys after booking the property.